Lucky enough to have a second day to spend in Ithaca and Tompkins County? Once you’ve visited some of the attractions on the One-Day Itinerary, use the following suggestions to explore Ithaca in more depth as well as venturing farther afield in the county to enjoy its cultural heritage offerings. Long known for its scenic gorges, Ithaca grew up around the waterfalls that powered its early mills. One of the most spectacular is the 150-foot Ithaca Falls, where Fall Creek drops dramatically on its way to Cayuga Lake. Stop at the Lake Street bridge overlook. From there it’s an easy walk to the base of the falls for a spectacular view (no swimming allowed, however! ), and interpretive signs relate the history and geology of the site. Take in a gorgeous sunset while swinging among the willows that line the edge of Stewart Park, Ithaca’s lakefront gem established as a municipal park in 1921. Originally a private amusement park formed by a trolley company in the 1890s, the park later was home to the Wharton Studio, a production company that filmed silent movie serials right on the park grounds and buildings. Bike or stroll along the Cayuga Waterfront Trail, where you’ll pass the city-owned Cascadilla School Boathouse, completed in 1896 and on the National Register of Historic Places. Bird-watch at the Fuertes Overlook and along the path through the Renwick Wildwood. Enjoy the historic carousel and the recently renovated accessible playground. From May to October, get out on Cayuga Lake with the crew of the MV Teal on the daily Discover Cayuga Lake tours (www.discovercayugalake.org). During the eco-tour, take water samples, identify aquatic and bird life, learn lake ecology and natural history, appreciate the architecture of lakeside homes, or simply take in a stunning sunset. Proceeds from the cruises help support the organization’s mission of providing educational access to the lake for all community members, including through the Floating Classroom and Trout in the Classroom school programs. Tompkins County is well known as dairy country and is home to one of the Northeast’s largest organic dairy farms—Freeville’s Jerry Dell Farm. Ithaca itself was reportedly the birthplace of the ice cream sundae, though two other towns contest that honor. The story goes that in 1897 a local Unitarian minister went to Chester Platt’s pharmacy at 216 E. State Street after church services and was treated to a dish of ice cream with a candied cherry and cherry syrup topping. “Why not call it Cherry Sunday in commemoration of the day on which it was invented,” the minister is reported to have remarked. The dish gained popularity with students, who then requested it from their hometown pharmacies, creating a tasty dairy trend. Take a modern-day taste test of Ithaca’s dairy heritage by visiting Purity Ice Cream and Cornell’s Dairy Bar for their take on the classic dish. Purity has been around since 1936, when Leo and Sylvia Guentert started making ice cream from Leo’s recipes. The current owners still use the time-tested recipes and produce small-batch ice cream using BGH-free milk from upstate New York farms. The Cornell Dairy Bar, housed in the beautifully renovated Stocking Hall, serves ice cream produced from Cornell’s very own herds by student apprentices at the Cornell Dairy, which has been making dairy products since 1880. You may not come up with a clear winner between the two, but you’ll surely enjoy the taste-testing. The charming village of Dryden proudly preserves its historical heritage through two town landmarks open to the public: the Southworth Homestead and the Southworth Library. 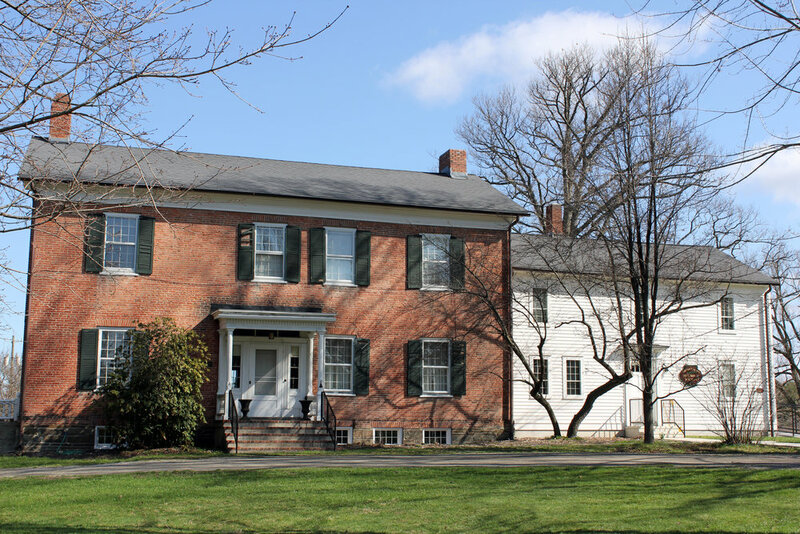 Built in 1836 by John Southworth (1796-1863), the Southworth Homestead is on the National Register of Historic Places and is the only historic homestead museum in Tompkins County. This early Dryden landmark near the original town crossroads is built in a transitional style between Federal and Greek Revival forms. It retains some of the home’s original design elements, including early wallpaper and blown-glass windowpanes. Enthusiastic docents from the Dryden Town Historical Society (drydennyhistory.org) offer regular guided tours of the homestead on the first Saturday of the month between May and October. Guided tours can be arranged by appointment by calling (607) 844-4691. Also named for the Southworth family, the nearby Southworth Library was the bequest of John Southworth’s granddaughter, Jennie McGraw Fiske. The grand stone library was designed in the Richardson Romanesque style by noted Ithaca architect William Henry Miller and opened in 1894. It is also listed on the National Register of Historic Places. Take a quiet peek into the original reading rooms with wrought-iron work and admire the new addition, made possible by the record-setting auction sale of a hand-written copy of Abraham Lincoln’s 1864 reelection speech donated to the library. While you’re in Dryden, stop by during business hours to the Dryden Mutual Insurance Company at 12 Ellis Drive in Dryden. The company exhibits a collection of Groton photographer Verne Morton’s images of rural life in upstate New York from the late 1890s to the mid-twentieth century. Just a twenty-minute drive north along Cayuga Lake from Ithaca, the tiny hamlet of Ludlowville is an off-the-beaten-track destination for a picnic or simply a quiet visit to rural Tompkins County. The Ludlow family moved to Salmon Creek in 1791 and soon after established a gristmill around which grew the community of Ludlowville Falls. Charming historic homes line the town streets, and the ruins of the old Ludlowville school still stand on private property. Access picturesque Ludlowville Falls from Ludlowville Park. If you’re a cemetery fan, take a detour to the small Asbury Cemetery nearby at the intersection of North Triphammer and Asbury roads. It was named for American Methodist bishop Francis Asbury, who preached at the associated church in 1811. Click here to download a printable pdf of the Day Two Cultural Heritage Itinerary. Click the button below to return to the Day One Cultural Heritage Itinerary. Click the button below to proceed to the Day Three Cultural Heritage Itinerary.